Santa Cruz is a beautiful place to live . . . but the coastal climate and rainy winters can mean trouble for local properties. Flooding in your area can mean flooding in your basement. Oceanside living can result in moisture accumulating in your walls and ceiling, creating a breeding ground for mold. Not to mention, any property can fall victim to pipe bursts or leaking at any time. 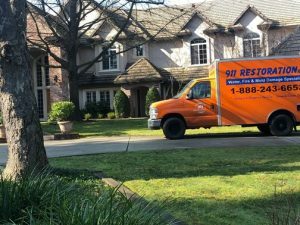 Fortunately, 911 Restoration of Santa Cruz has water damage restoration technicians available around the clock to make sure every property disaster is only a temporary setback. Reach out to us any time, day or night, and our highly trained professionals will be at your door within 45 minutes, guaranteed. The experienced staff knows there is no time to waste when it comes to water damage. Lost belongings and ruined flooring are only the beginning. 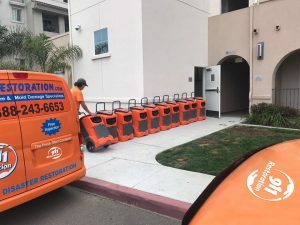 Without the support of fast-moving, relentlessly thorough technicians, your property is vulnerable to long-term effects of a water-related mishap, including mold infestation. 911 Restoration of Santa Cruz offers truly comprehensive service, from flood cleanup to mold decontamination. You can count on the staff to treat your crisis as if it were their own. They’ll even save you the headache of dealing with insurance by filing your claim for you. At 911 Restoration, our goal is to help you put property damage behind you as soon as possible so you can get back to loving your life as a property owner in California’s most beautiful county. Call us today for a Fresh Start. It doesn’t matter if you’re dealing with a burst pipe or a slow ceiling leak. If you’ve got unwanted moisture in your home, you’ve got an emergency. 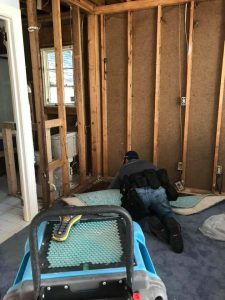 When you call 911 Restoration of Santa Cruz for help with water damage, restoration technicians are on the scene in an instant. They go to work immediately, packing out and storing your undamaged belongings before tackling the flooded or damaged area. Then they begin complete water extraction according to the needs of your unique situation. Using professional-grade dehumidifiers, the water remediation staff dries out the area completely. They also follow up with leak detection and repairs to ensure that they have eradicated the root of the problem and not just the problem itself. To truly restore the health of your home or business, they even offer mold inspection and removal. After all, it takes no time at all for the presence of water to create the presence of mold. Your dedicated restoration team won’t consider their work done until they know your property is better than new. If you’re facing water damages in Santa Cruz, Watsonville, or the surrounding communities, call us today. We offer more than water extraction. We offer peace of mind. Our water damage restoration experts are also IICRC certified mold remediation professionals. It only takes 24 hours for mold to grow in a water-damaged area. It doesn’t matter if you’re dealing with a minor mishap or a full-blown flooding emergency. Water in your property means you’re at high risk for mold contamination. Moreover, mold poses significant threat to both the integrity of your property and your own personal wellness. Individuals living in mold-infested homes report issues with dizziness, headaches, allergies . . . even respiratory issues and heart problems. Mold removal is imperative. In order to be fully confident that your home is mold-free, you need a trained eye and professional knowledge. You can’t fully vanquish mold with your kitchen cleaning supplies. The mold remediation team offers a free visual inspection for property owners, third-party laboratory mold testing, and expert mold removal. By the time our specialists say goodbye, you’ll be able to rest in the knowledge that no stone has been left unturned. Your property is dry, renovated, and fully protected against those sneaky, long-term damages that can set in long after a water-related disaster. At 911 Restoration of Santa Cruz, we don’t rest easy until we know you can do the same. Call us today for compassionate, expert water and mold removal . . . and a Fresh Start. Servicing the cities of Aptos, Aromas, Ben Lomond, Boulder Creek, Capitola, Carmel, Carmel Valley, Los Gatos, Castroville, Del Monte Forest, Felton, Freedom, Gilroy, Gonzales, Greenfield, King City, Marina Davenport, Monterey, Morgan Hill, Pebble Beach, Pacific Grove, Seaside, Soquel, Salinas, San Juan Bautista, Santa Cruz, Swanton, Scotts Valley, Prunedale, Soledad, Watsonville, and surrounding areas.